The EcoFAST™ Push-fit Series filter cartridges are easy to change by pushing the collet or washer flush with the cartridge for easy removal and speedy filter change. Each time you change your filter cartridge, you are replacing a fresh new housing as well. 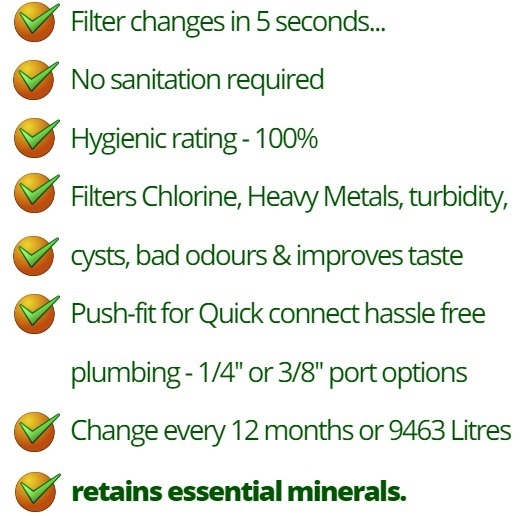 Chlorine, taste and odour Water Filtration System drastically reduces organic contaminants, heavy metals & chlorine resulting in cleaner filtered drinking water from the kitchen faucet. Save on daily, weekly and yearly costs of buying expensive bottled water and have filtered water at your kitchen sink. All parts and kit included for easy do it yourself installation at a cost effective price. 3 metre of 1/4'' or 3/8'' ldpe white tubing included. Note - Self piercing 1/4'' saddle valve is supplied as standard but if you don't have copper piping on the inlet water feed, we supply below or to the right depending if your viewing our website from mobile or desktop. Simply look at the sizes - 1/4'' or 3/8'' and make sure you select these measurements in all your choices the way down before checkout. 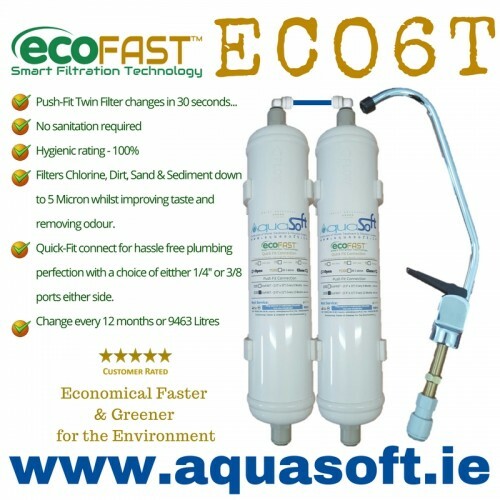 ECO6 Series Water Filtration System from EcoFAST™The EcoFAST™ ECO6T replacement water..